Accuweigh’s QWM branch in Brisbane installed a public weighbridge for public vehicle weighings at the SEQ Hauliers depot at Hemmant, Queensland. Public weighbridges are open for use by the public in return for a nominated charge. Public weighbridges are monitored by state inspectors to ensure accuracy and compliance with the Trade Measurement Act. 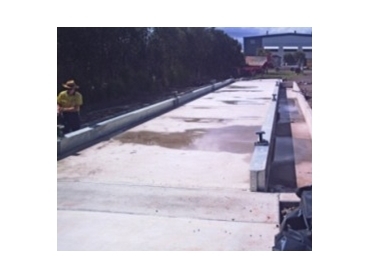 The Accuweigh public weighbridge installed for SEQ Hauliers was constructed with a durable concrete deck measuring 28 metres in length to accommodate B Double Road Trains in a single weighing transaction. For ease of truck access, the weighbridge foundations use a semi-pit design to keep the weighing deck at ground level. The public weighbridge was manufactured in Brisbane by QWM at Geebung with a heavy duty design.